I don't want to scare you, but, I'm an Adventure Sphere. Designed for danger. So, why don't you go ahead and have yourself a little lady break, and I'll just take it from here. 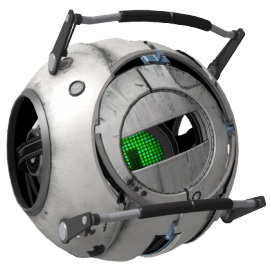 The Adventure Sphere, also known as Rick, is a corrupted personality core of male programming who appears in the single-player campaign of Portal 2. He is one of the cores retrieved by GLaDOS for Chell to attach onto Wheatley, in attempt to initiate a core transfer procedure via corrupting his control of the central core body. The Adventure Sphere speaks in the manner of a stereotypical "tough guy", spending most of his time boasting about his bravery and lust for danger. Upon seeing Chell, he flirts with her and makes increasingly chauvinistic comments. He even tries (but to no avail) to convince Chell to take a "lady break" while he deals with Wheatley by himself. Rick, along with all the corrupted cores, is voiced by Nolan North. When GLaDOS sends him up for Chell to attach, he is hanging and swinging on a wire, in a manner not unlike that which would be expected from an archetypal adventurer coming to the rescue. The Adventure Sphere at one point makes reference to his supposed many black belts in various martial arts, including "Larate". Larate was first mentioned in the hidden webpage of the WAR! Update in the Valve multiplayer game, Team Fortress 2. In the unused audio files, Rick can be heard yelling at both the Space Sphere and the Fact Sphere. This could be used for three things: used when they are in the cage right before the boss fight begins, while on the central core body, or he and Fact Sphere were going to be in the ending cutscene. When Chell places the final portal on the moon, Rick is almost imediatly sucked out into space before Wheatley and the Space Sphere. This is unlike what would be expected from a typical adventurer. A minor easter egg involves holding onto the Adventure Sphere for an extended amount of time. If you listen to the Adventure Core's dialog for long enough, he will ask Chell about getting Wheatley to say "You have been a thorn in my side long enough! ", because he has a "cool line" to reply with. After attaching the Fact Sphere, Wheatley says the line; the Adventure Sphere responds with "Yeah? Well this thorn... is about to take you down.' Man, that sounded a whole lot better in my head." This page was last modified on 27 October 2018, at 15:12.